Until fairly recently, home security was relatively low-tech. A burglar alarm, a bulky camera, a sign in the yard announcing that your home is protected by XYZ Security – these were the tools meant to ward off potential home invasions. Today’s technology has ushered in a new era of home security, one in which homes aren’t just safer, but easier to control with just the touch of a smart phone screen. If you’re looking to have a home security system installed, first decide what kind of system you want. 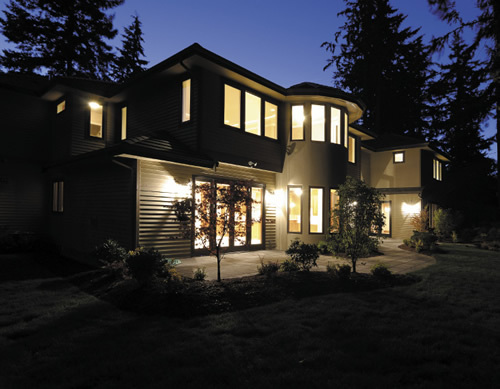 For new builds, you may go with a traditional wired system, where the components are hardwired into the home and connected to a central control panel. But, says Christopher Bracken, vice president of Action Security in Anchorage, “90 percent of what we run into is after construction, so we typically do wireless devices.” A wireless system uses radio waves to communicate between the control panel, sensors and cameras. While the components can be a bit bulky, one big advantage is you never have to leave the system behind; when you move to a new home, your security system can go with you. “Security’s not an amateur’s game,” warns Bracken, but that won’t stop fly-by-night security companies from sending inexperienced – and sometimes unscrupulous – door-to-door salespeople your way. Oftentimes, these traveling sales agents will try to pressure you into buying expensive but substandard systems by offering you limited-time offers, pressuring their way into your home or claiming to be from your current security company. Don’t fall for it. If you’re in the market for a security system, seek out a reliable company with a good history and a staff of experienced installers. Wireless systems can also be integrated with phones and computers, allowing for remote access. “With these newer systems, you can call in and adjust the temperature of your home, turn the heat on, turn on some lights,” explains Bracken. Bracken sees a big advantage in remote access, particularly for Alaskans who own houses or cabins in far-flung parts of the state. “People who own these cabins, they want a way to turn on the heat from afar,” says Bracken. “The best way to do that is not through the heating and cooling industry but through the alarm industry.” With a wireless system, controlling your home from far away is as simple as turning on your smart phone and opening an app. While there are also higher-end cameras that do allow recording, the real advantage to newer security cameras is the interconnectivity they create when paired with your computer, smart phone or iPad. The cost of a new security system depends upon the features and coverage it offers; smart buyers will shop around first to see which system best fits their budget and their lifestyle. Part of the expense is the monthly service fee: With home automation, your cell phone communicates to a server via encrypted data, and the server is what controls your security system. That, says Bracken, is what you’re paying for.